Have you read “Day of the Triffids”? 🙂 Knowing the species and the setting, I definitely get a “triffidy” feeling from this wonderful photo. Your spelling of Triffids looks ffffine to me, MMMelissa. Oh, very nice. When will your book be published??? When some publisher somewhere wakes up to how good it is (said the author modestly). A couple of friends of mine self-published, via Blurb, a very nice picture book of nature photography, Steve. The only problem there is also my biggest challenge…self-promotion, A publisher does that and, well if you are the publisher then it falls upon you to promote. Photographer’s Market might be of help and I’ve seen Barnes and Noble, for instance, publish and sell small books by unrepresented photographers. So if I am telling you this, why am I not doing it? See my problem described above. Getting up before the sun and getting out while there are no other people, no traffic and crisp clean air is a real treat. I am glad that you were able to do it even if just this one time. Using shadows to hide unwanted stuff or create an air of mystery is another perk with getting out either early or late. The book I conceived would take the economy of scale provided by a commercial publisher, or else individual copies would be too expensive. And then, as you said, there’s the big problem of promotion. I’ve been thinking more along the lines of a series of e-books; there’s still the problem of promotion, but no longer of expense. I got out before the sun a second time recently, and maybe I’ll show a picture from that excursion too. You’re right that there’s an air of mystery in the semi-darkness, and I felt it during those two ventures. E-books can work very well. Many well known photographers…John Shaw, William Neill, Guy Tal etc…do pretty well that way. It’s definitely a way to keep costs under control and keep things economical for your customers. I’ve a few of them but, to be honest, the enjoyment of the images just isn’t the same as holding a well-printed photography book. I’ll look forward to your next early morning image. I expect you recognized your old stomping grounds in the two previous posts. Ragweed and a dirt pile never looked so good. Your mention of the word “rank” in your comment to Melissa brought to mind another, older use of the word, and a song that works especially well with your photo. I’m sure it’s often been sung on front porches that had a view much like this, and I can imagine the poor ragweed joining in on the chorus. I’m not sure I’ve encountered rank in the sense of ‘utter,’ but giant ragweed is the uttermost ragweed of them all, that’s for sure. You might say I come at angles from various angles, partly as a math person and partly as a photographer. In that second role I’ve gotten used to bending, squatting, kneeling, sitting, and even lying on the ground to get a better angle on a subject than a straightforward view would provide. I agree, I say closer the better. I photograph flowers all the time, they are fascinating and yet beautiful at the same time. Thank you for your reply. I enjoy your work. And thanks for your enjoyment. The colours in the sky! Wonderful! 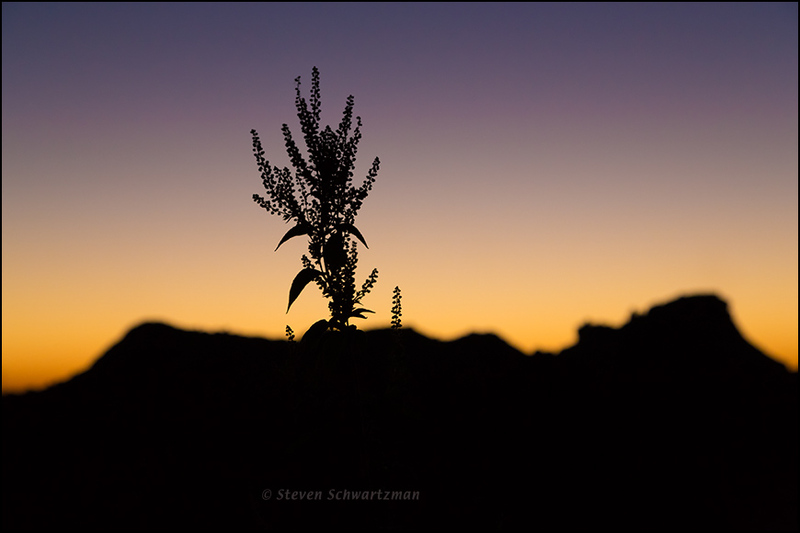 I do love the soft hilly background against the crisp silhouette of the plant. I am most decidedly a morning person, but my sunrises are viewed through many trees along my creek, not exactly photo-worthy (I’ve tried). That’s why I headed for a flat and rather open place where I hoped there wouldn’t be obstructions to the view. The dirt pile is an obstruction of sorts, but I incorporated it into the image for its out-of-focus contour that could pass for a mountain range’s. Yes, I was pleased with it.